Summer in Florida is challenging. It is hot. Your only chance of catching some decent breeze is at the beach. Local produce is scarce – only tropical things like growing in this heat. But there is some magic to a Florida summer. For one, we have lychee season in June. 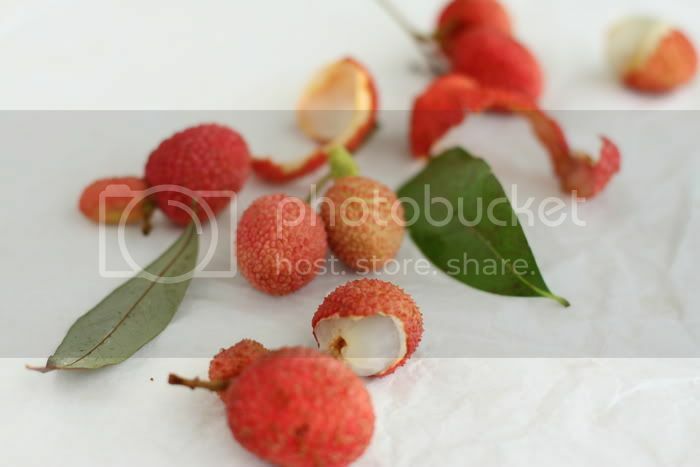 It’s difficult to describe the taste of lychee fruit. They are sweet and juicy, and taste like the work of a very hot sun. Once peeled of their spiky skin, they look like little jelly fish with a smooth pit in the middle. It’s a short season, a couple of weeks maybe. During the time, the tree owners are usually up against an eager army of squirrels. The height of the trees and their light branches don’t help the harvesting either. When my friend Cathy offered me some of the lychees that her husband Johnny heroically picked from their tree, I was very grateful and right out the door to get them. Cathy is the friend who always knows all the when, where, and how, and one we can always count on in case of any emergency. We ate about half of the lychees as they were, getting ourselves and the kitchen sticky with the juice. 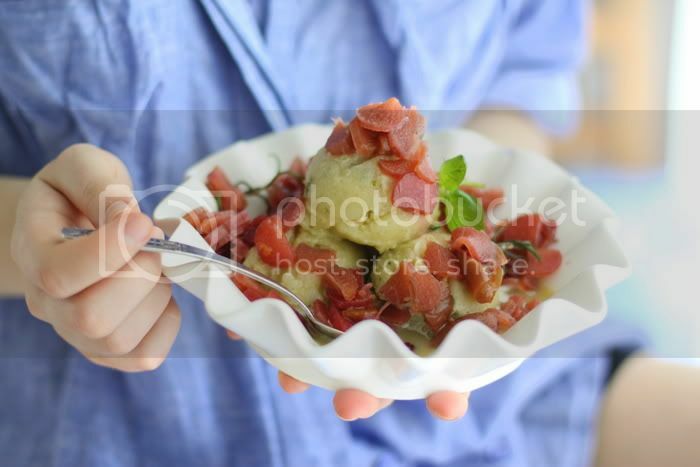 The rest went into a sorbet with a bit of basil and lime juice. I had a great dessert of lychee sorbet and rhubarb compote at Tokyo Eat, the restaurant at Tokyo Palace in Paris. It was a delicious dish, the inspiring kind that I filed in the back of my mind. I did not grow up with rhubarb, and never tried it until recently. Seeing it all over the food blogs in the spring and early summer, I was very curious to cook with it. 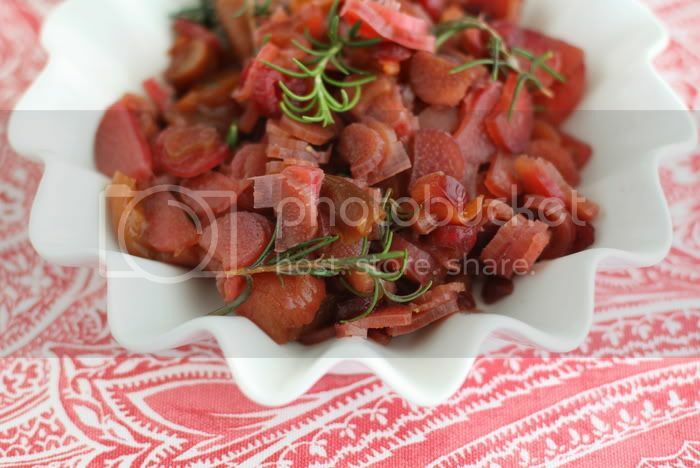 I found an intriguing recipe for raw marinated rhubarb about a year ago but could never track down the main ingredient at any local markets or Whole Foods, no matter how much I tried. 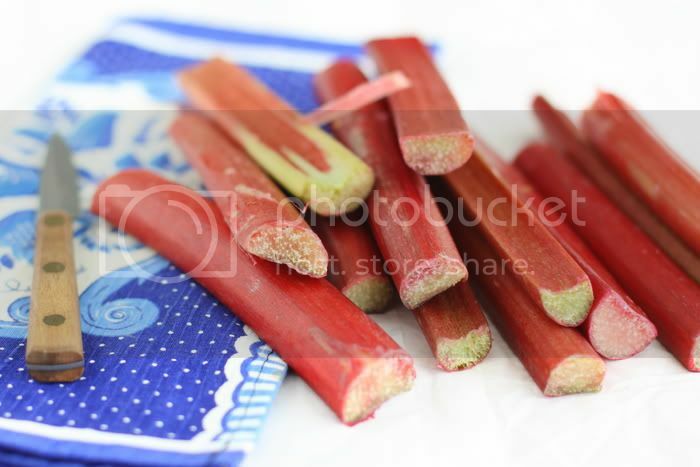 But then, the other day, I walked into a produce section and there it was, rhubarb, all red and ready to become a dish. The timing was perfect. The 90+ (32 C) degree weather leaves us wanting things iced, light, and fruity. This dessert is all of the above. The rhubarb marinates in a mixture of thick honey, Grand Marnier, and rosemary for at least a day and night. During the process, each time you open up the container to stir, you’ll see and smell the rhubarb transforming, becoming more fragrant and full of flavour. It retains its tartness, but balances with the sweetness of the honey and liqueur, all the while absorbing the rosemary’s aroma. Whether eaten separately, or (even better) together, these two are the ultimate way to fight the heat. Puree the lychees in a blender. Add the rest of the ingredients and puree until smooth. You might need to blend in 2 batches. Chill well in the refrigerator, and process in your ice-cream maker for 20-25 minutes. Optionally, add more basil pieces at the last 5 minutes of the freezing process. Freeze for at least 2-3 hours before serving. Mix the sliced rhubarb thoroughly with the rest of the ingredients and marinate for at least 24 hours, stirring occasionally. Remove rosemary from compote before serving. That looks so refreshing and delicious! I didn’t know that you could eat rhubarb raw. Looks amazing! 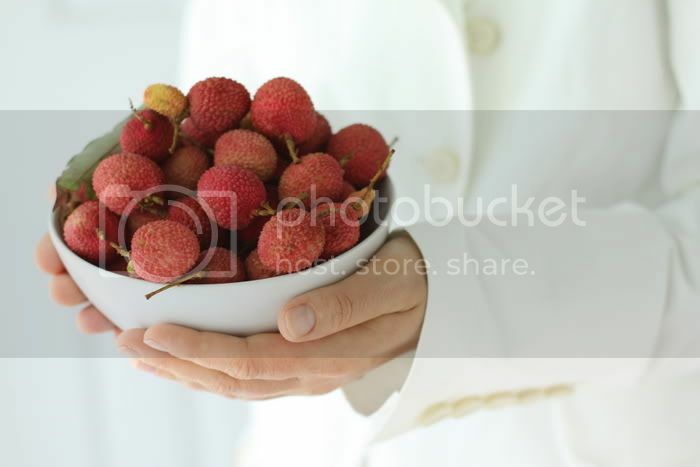 I love Lychee fruit. I am going to make the sorbet some time next week. Thank you for sharing. you never cease to amaze and impress. what a fantastic combo and two ingredients I would have never thought of using together. awesome pictures as well, thanks for sharing…and inspiring! I was desperetaly in search of a raw recipe for rhubarb, unable to find it in my 5 raw cookbooks. Thank you! Do you mean to say Grand Marnier? I have never heard of Grand Meringue. Girl in the brown plaid shirt, thank you so much for the correction. Ok so marinating rhubarb is another trick to eating it raw. 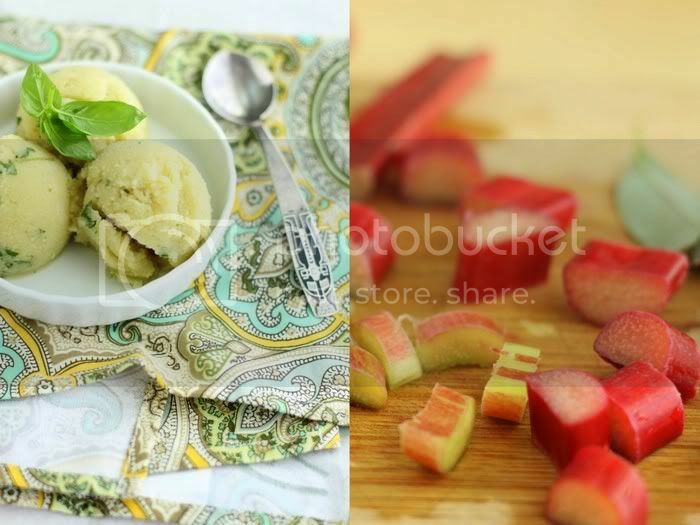 I’ve eaten rhubarb as is raw and it can be too…um, detoxifying. Freezing it helps with that affect as well. I love lychees! I remember having them in China in the summer where it gets very hot. have it served up like Golubka. I am sooooo glad I’ve found your gorgeous blog today! Sweet Faery, so glad you can use this recipe. Julie, it is in the air, I saw your beauty of a post. Bitt, yes I’ve heard that raw rhubarb just by itself is hard on the stomach. But this compote did not have this effect on any of us, the marination probably helps. Kelsey, thank you, glad you liked them.